Mountains, kichwa, indigenous communities, amazon, Galapagos and beaches all compacted into one country; Ecuador. This beautiful country is the kind of destination one cannot easily spot on every blog, nor every magazine as France or Italy are. Some may interpret that as a disadvantage, but I don’t. Do you want to know why? The answer is quite simple in fact, being off the radar ends up being a box full of surprises and my point is proven with this post. The title for today’s topic is 24 hours in Ecuador. By now you are probably expecting a classic walk tour through the main capital and then a flight to the Galapagos, which is most likely the main reason many people travel to Ecuador. Fortunately this post is not gonna be like that because we are disrupted aren’t we? That being said, I invite you to prepare yourself for an original, special and beautiful 24 hour adventure in Ecuador. I know schedules are boring and too routinary, hence I have decided to delight you by contrasting two different scenes that we were able to witness at the same time, in the same place, Ecuador. A family has decided to share their joy in Quito at Illa Experience Hotel, they were intrigued by its name, its concept and the details put into every little decoration. They expected to be staying at a beautiful, yet “normal” hotel. Despite this, they were not expecting to be overwhelmed by its story and its past. After visiting the city of Quito for the day, they decide to come back to their hotel and rest while enjoying an exquisite meal. As they enjoy their alone-time at the rooftop bar, they were not expecting the skies of Quito to turn into a show. The vivid colors, the peace, the energy, the Panecillo Virgin in the middle; all made that evening so special. It was in that moment where one could witness how Illa’s name was somehow being personified. “Sacred light”, that is what everyone was seeing. Perhaps you feel like I am exaggerating, and I am so happy to say that I am night. It was like all of us were one with Illa and with the sky. This is the beauty of being an undiscovered city amongst many famous, everything is so special; travelling becomes more of an experience than just a “cross-off your list” sort of destination. While Quito is delighting its citizens and its visitors, the Galapagos is not staying behind. The fauna, the flora and the evolutionary history are all beautiful things that make the Galapagos so special and somehow unbeatable. 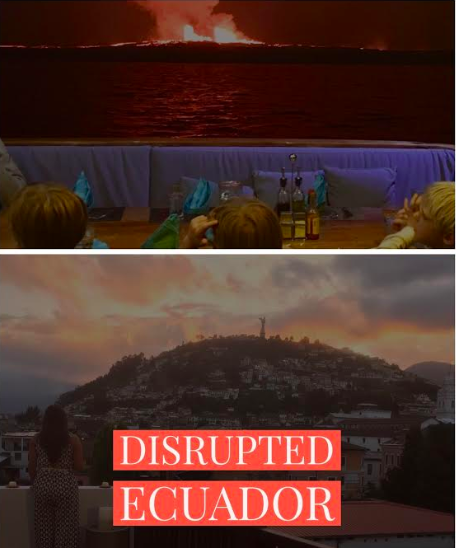 Wait, I said Ecuador was disrupted right? Yes I did, and here is why. Right at the moment where you think nothing else can get better, it does. A volcano in the islands started to erupt, bursting and flaming magma could be seen from miles away. No animals nor species were in danger, but our heart rates were sure in a rush! The fierceness and the greatness of the eruption made one feel as tiny as a fish yet as big as the volcano itself. It was in that moment where everyone was witnessing the earth and the sky joining together in a show of lights and shadows. Incredible isn’t it?